A new station was opened in Newton Aycliffe. The station had a bay garage. The station was crewed using a day-manning system and as a result houses for the crew were built. The opening of the station enabled the closure of the old fire station. The appliance bay previously used by the ambulance service was acquired and in addition an extra bay was added to the station. The first stage of new fire station was completed. 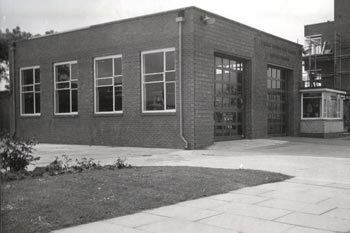 The new fire station was constructed on the same site as the original site and included accommodation, catering lecture and recreational facilities in addition to the appliance garage. The second phase resulted in an extension to the appliance bay making the station a three appliance bay station and a refurbishment of the original station. The station was the only station was in the Service using the day-manning system. In February 1991 the station was upgraded to a whole time and retained duty system crewing system.